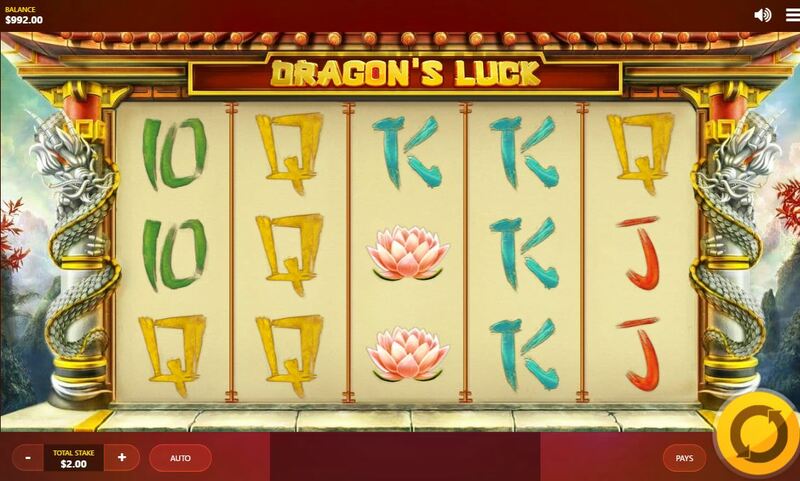 Dragon's Luck slot has a title which instantly tells us we have another Oriental theme from Red Tiger, something this particular developer has a fondness for. In this case we have a reel set which sits against the background of a pagoda with dragons twisted around the pillars either side of the reels with matching Chinese music and when the mystery symbols land on most spins, a dramatic crash of cymbals as they reveal their secrets. So can this Dragon add some of his luck to our game play? We have 5 reels of 3 rows each but only 10 pay lines, a format seen in other slots from this developer such as the not so great Mega Jade and slightly more impressive Wild Spartans. These 10 lines though have adjacent pays so 3 consecutive symbols anywhere on the line win! To compensate even more we get stacked symbols too to increase our chances of which the 138 icon (a Chinese lucky number) is the best and pays 1380 coins for a 5-of-a-kind win or in plain figures 138x bet. The Doll offers us 40x, the Goldfish 30x, the Lotus flower 25x before we get to the card values paying 10 or 20x bet for the full 5. It wouldn't be a Red Tiger game without some in-play additions and the first of these are the stacked gold coins which appear most spins and as the Dragons at the sides breathe fire on them they turn 3 times to reveal mystery symbol, hopefully a useful one, underneath. Then we come to the second enhancement, a 'mega coin' which is present every spin and is a giant 3x3 block which can be on any 3 adjacent reels. Naturally is this lands fully or partly in view you will have a guaranteed win. 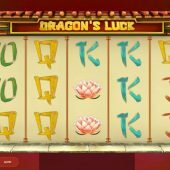 There are no Wilds or scatters either as we don't get a designated bonus feature but a full screen of the 138 icon will award a fiery 1380x bet as the Dragon's Luck jackpot. There is one random in-play event though - after the mystery symbols have turned to reveal the hidden icon, if it is low the Dragons may get second wind and decide they aren't good enough and burn them away to reveal a picture symbol to improve your win.